Namdapha National park proposed in 1947, was declared a wildlife sanctuary and subsequently National park to join the Project tiger network. This tiger reserve is the only jungle in world to have four feline speices coexisting; tiger, leopard, clouded leopard and snow leopard. This place situated in dense vegetation of Aurnachal hills have over four hundred varieties of orchids. This rain forest is situated on banks of river Noa-Dihing and is located 150 kms from blue hills of Patkai mountain ranges near Miao. 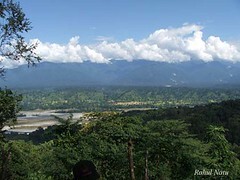 This place is one of the places you must visit in North East India. Namdapha Tiger Reserve is delight for Nature and Trekking lovers. This torpical Wet Evergreen forest in the Changland District of Arunachal have altitudes varing from 200m to 4500m above sea level. It is home ot some of the endangred species like Slow Lorris and Hoolock Gibbons; the only ape species of India. Other animals which could be sighted include elephants, black bears, deers, Leaf deer, black barking deer,Assamese macaque, pig-tailed macaque, stump-tailed macaque, Indian Bison, White winged wood duck, Great Indian Hornbill. Namdapha tiger reserve is actually sandwiched between Myanmar on east and south, while Himalayan foot hills on west. About 57 tigers have been reported in this virgin jungle. Best season to visit Namdapha Tiger reserve would be after monsoon, October to April. To visit most places in North East India, permissions are required. To visit Namdapha National park permission could be sought from Arunachal bhavan in New Delhi. Indian tourists need obtain inner line permits, while foreginer visiting Arunachal Pradesh need to get Restricted Area Permit from Ministry of Home Affairs, New Delhi 15 days prior to visit. Other conditions for Foreign tourists include minimum group of four persons. Permit is extendable by 10 days. Documents need to be brought include Xerox copy of Passport and Visa and passport size photgraph. 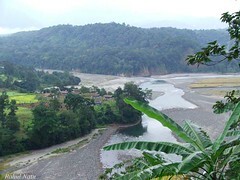 Deban is forest camp located on banks of river Noa-Dihing and provides trails for trekking and hiking. Firmbase is popular cmaping site located 25 kms from Deban. Forest department provide equipments and guide for camping here. Hornbill located about 9km from Deban is home to flocks of hornbills. Haldibari camping site is about 5 kms from Deban and can be reached by boat. Overnight stay can be made at this place. Bulbulia is excellent camping site with several natural springs. Camera Point camping site provides excellent view of Namdapha forest. Motijheel spot with grazing pastures is good place to spot herbivorous and birds. Gandhigram located on southeast periphery of forest is the remotest and last village in India on borders of China and Myanmar. This places is home of Lisu tribe and is located about 120 kms from Deban. It has to be reached by a week long trek through dense jungles. view from motijeel photo by Rahul NatuGuwahati is the nearest internationa airport to reach here. However, one may have to come via Delhi for arrange restricted area permits. Mohanbari, Dibrugarh is the nearest domestic airport located about 160 kms from Miao. Tinsukia Railway Station in Assam which is the nearest long distance railway station is located about 141 km from Deban. Miao in the Changlang District of Arunachal Pradesh is entry point for Namdapha. State buses regularly ply from Dibrugarh and Tinsukia to Miao. From Miao, one may hire a vehicle and reach Deban located about 26 kms along the forest roads intersected by several streams and rivers.